Mailstore, one of the world's leading solutions for email archiving, management and compliance for Small and Medium-Sized Businesses (SMB) easily works with MDaemon Messaging Server for Windows. Mailstore works seamlessly with MDaemon to create 1:1 copies of all emails. Access archived email using Microsoft Outlook, MailStore Web Access, or mobile devices. Combines powerful technology with low cost and user friendliness. MailStore Server is used by over 10,000 small and medium-sized businesses. 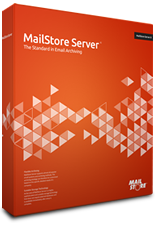 MailStore Server can be installed in just a few minutes on any Windows PC and tested immediately. All of the components you need are already integrated. No changes will be made to servers or emails while archiving. With its low acquisition cost, minimal system requirements, integrated storage technology, and efficient use of system resources, the MailStore Server solution offers excellent value for your money. At the core of MailStore Server is a highly sophisticated and scalable storage technology that does not require external databases and is available immediately after setup is complete. In practice, this allows for installations that support more than a thousand archived mailboxes and the users who access them. MailStore Server is not a one way street. All email can be restored from the archive in standard formats at any time. This guarantees companies independence over the long term â€“ even if you move to a new system. Copyright © 2016 Alt-N Technologies. All trademarks are property of their respective owners.